Today’s Daily is the “Theme from Jets ‘n’ Guns”, that high-octane, “ultimate fiery and bloody experience” composed by Machinae Supremacy. They mix rock guitars with C64 chip music, creating a pretty sweet blend. Here the synths are a bit more subtle (they are core to many of the later tracks) and the guitar takes center stage. I tend to prefer this type of music more than some of Machinae Supremacy’s other work, but chips and rock guitars are a great mix any way you cut it. Other than that, this Daily is going to be a bit short – just listen to the music and check out the band’s website for the rest of the soundtrack in both OGG and MP3. Jets’n’Guns is a comedic, tough-as-nails space shooter for the PC and Mac. The game has a strong aesthetic for biplanes and zeppelins while also including sporty racecar-spaceships, floating guns, and space bugs. The game also has a ton of Metal Slug-esque humor arising from a profusion of explosions and tiny, messily-exploding soldiers as well as humorous characters, signs, and other oddball humor (the title screen advertises it as ‘The ultimate fiery and bloody experience”). All the sprites are prerendered and the game has some fantastic particle effects. The full version is available for $29.99 as a download and is well worth it (though I’m surprised the price hasn’t dropped as the game is a bit old). 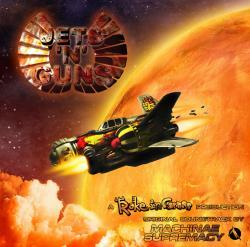 “Hero” was originally composed independently of Jets’n’Guns and is available as a free download from the band’s website. The band Machinae Supremacy had been known at the time for their combination of chiptunes and rock guitars and especially for remixing C64 songs. This style was a perfect fit for the retro feel of JnG. Since the completion of the game, however, Machinae Supremacy has become a very popular – and expensive – band, and so Rake in Grass could not afford to hire them to produce new tracks for the Gold expansion set. Incidentally, the entire soundtrack is also available for download from Machinae Supremacy’s website (minus the new tracks from the Gold edition). Some of Machinae Supremacy’s lyrics have this sort of ’emo teenage male’ fed on angst and the wish fulfillment provided by edgy media. However, this piece works very well inside Jets’n’Guns because this simplistic narrative is essentially what the game is about (that and blowing up a giant mile-long space cannon to kingdom come) Read the rest of this entry ?